Brooklyn meets Larchmont in this unique custom design by Grupo Design. 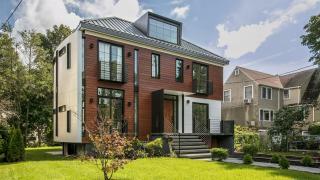 Enter a different realm of contemporary; up the granite steps to the porch with metal railings, through the mahogany front door into the most dramatic interior space imaginable - from the placement of the windows and the open wood and metal floating staircase to the sleek curves and lines. Crisp and clean white walls meet rich espresso hardwood floors throughout. Contemporary 2 toned cabinets in the dine-In kitchen and versatile living space allow for more dining/family room/office on the first floor with a glass fireplace anchoring two rooms. The floating staircase alongside 20' windows brings you to the second floor with the master suite and bath with a jetted soaking tub and separate shower, an en suite bedroom, two more bedrooms, a hall bath and laundry room. Legal lower level has a large family room, guest/nanny bedroom and full bath. The landscaped property and brick paver patio allows for dining al fresco.